The Five Sharps "Stormy Weather"
The Five Sharps were a short-lived vocal group from Queens, NY. They are best known today for their recording of "Stormy Weather". "Stormy Weather" is today considered one of the most collectible doo wop singles ever released. In 1952, after months of performing at local functions, The Five Sharps were spotted by a producer and taken into a studio to record two songs. The group recorded their own "Sleepy Cowboy" and the standard "Stormy Weather". The session took most of the day and they were paid in hot dogs and soda pop. First tenor Bobby Ward remembers that sales of "Stormy Weather" were so bad that he and the other members had to buy their own copies even though they'd never been paid for the recording in the first place. 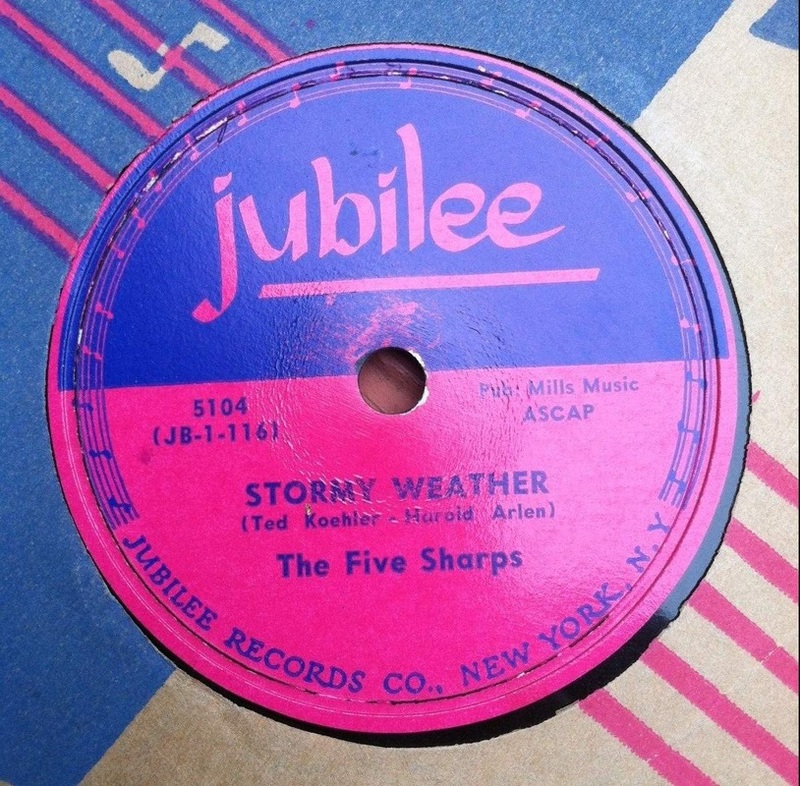 Since Jubilee, in 1952, had been releasing singles on both the 78 and 45 formats, collectors assumed that there must be a 45 somewhere (even then, collectors valued 45s much more than 78s) none ever surfaced however, and only a handful of 78's of "Stormy Weather" have ever been found.